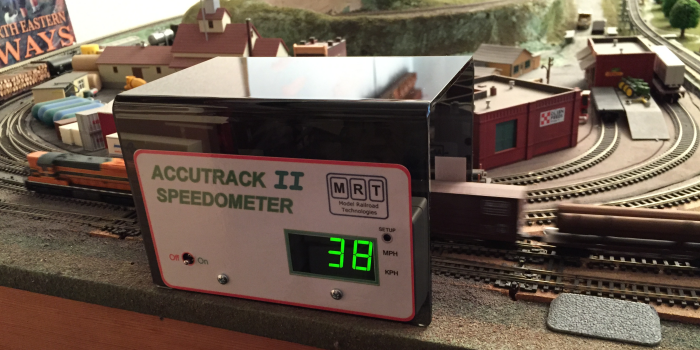 We now offer a choice of methods to see the speed of your model railway. There is an option to drop into your - or your friends' - layout, and see at a glance how fast those speeding trains are really going. Alternatively, build in the speed sensors and bring the display to your front panel. Have you ever wanted to know the scale speed that your trains are achieving as they run round your layout? 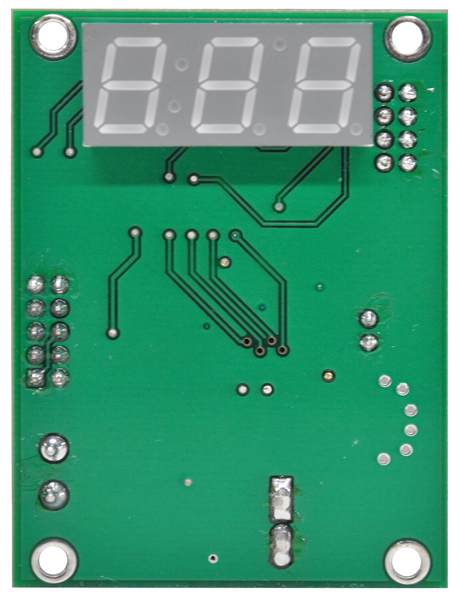 Now you can do so, easily, with our layout Model Railroad Speedometer. and displays the correct scale speed of a train as it passes, in either direction. Suitable for DC or DCC, the unit runs from two AAA batteries (included) and has auto power off when not in use. This easy to use ACCUTRACK II Speedometer is available from our online store. this unit stands over any track, and displays the speed of a train as it passes, in either direction. The "tunnel" is large enough to straddle two N tracks, or one H0 track, and is tall enough for double-stack containers. Seen here measuring 38 MPH for this N Scale freight train. See our Application Note for using this Speedometer to help set up speed-matching of locos with SPROG. 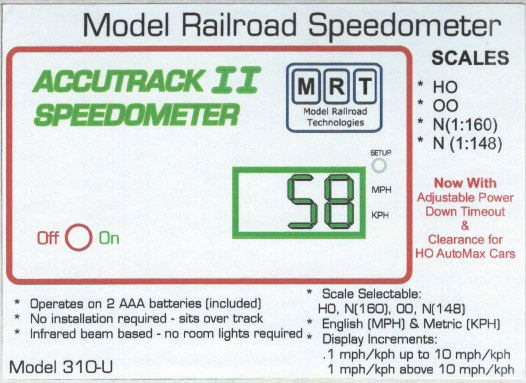 Click here to order your Accutrack Model Railroad Speedometer. The Trainspeed system is designed to measure the scale speed of your trains as they pass by sensors placed at a specificed distance apart. Two small light sensors are set into the track, and as the train passes over, the Trainspeed system calculates the time taken, and so the speed of the train. By placing the sensors at the right spacing, this system can be set up for any scale. The sensors are designed to use available ambient light. It is best to pick a well lit section of the layout where the light source comes from above and ‘inside’ the layout. The Trainspeed 1 package includes everything that you need to build in speed measurement at your chosen location, including 2 sensors, cable (10 feet in total length) and control/display module. Power can come from any accessory supply 6V-18V AC or DC, or purchase our 12V supply. See the full manual for more information about installation and setup. Click here to order your Trainspeed speedometer kit. 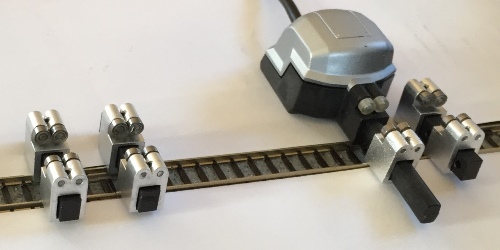 We previously offered the Bachrus DCC speedometer, available in N or HO scales, which was ideal for setting up and speed matching locos on the programming track, in conjunction with your SPROG (or other DCC system), computer and DecoderPro. The Bachrus system is based on a "rolling road" concept. Supplied with sufficient rollers and rails to support 8 powered axles (think articulated steam, or big diesels) and a tender or other unpowered wheels, these were ideal complements to your loco setup environment. The Bachrus products are no longer available or being manufactured, and so we are unable to take any further orders. This note reamins here for reference and support only. - The NMRA S9.2.2 specifies that all decoders must provide CV2 (Vstart). The provision of CV6 (Vhigh) and CV5 (Vhigh) is optional. These three CVs are to be active only when Bit 4 of CV29 is 0. Speed tables are optional and use CVs 66 (Fwd Trim) 67-94 (the actual speed curve) and 95 (Rev Trim). These thirty CVs are to be active only when Bit 4 of CV29 is 1. The disadvantage of this speed table specification is that any tweaking of starting or maximum speeds requires reshaping of the entire speed curve. - SoundTraxx Tsunami decoders differ from the standard. added to CVs 67-94 in the speed table, pushing it upwards. but the disadvantage is that you can effectively flatten the top end of the speed table it the maximum speed was already high. - QSI decoders differ from the standard. When the speed table is active (Bit 4 of CV29 is 1), the values in CVs 2 and 5 are not ignored. so the actual curve starts and/or ends on any non-zero value in Vstart and/or Vhigh. the curve will be expanded, with possible integer multiplication errors producing glitches in the speed table. - ESU V4 and Select decoders differ from the standard. When the speed table is active (Bit 4 of CV29 is 1), the values in CVs 2 and 5 are not ignored, but ALWAYS specify the actual Vstart and Vhigh of the loco. In addition the value of CV67 is fixed (read only) at 1 and the value of CV94 is fixed (read only) at 255. You therefore need to fit your speed table curve shape between these fixed end points. The effective values in CVs 67-94 are compressed (in the decoder) so the actual curve always starts and ends on the values in Vstart and Vhigh. without reshaping the whole curve and without the possible multiplicative errors in the QSI approach. The LokProgrammer and JMRI DecoderPro software both enforce the restrictions on CVs 67 and 94 so you know what your speed table will actually look like. Also, the minimum value for CV2 is 1, so you cannot set the loco to be stationary at step 1. The important thing to make very clear is that ALL FOUR DIFFERENT APPROACHES ALLOW FULL CONTROL OF SETTING THE ENTIRE SPEED RANGE OF THE LOCO. There is no limitation on setting of starting or maximum speed. But you MUST be aware of the different ways of setting up different decoders. The other important point is that THIS DOES NOT PREVENT SPEED MATCHING of different brands, you just have to be aware of the different ways of setting up each brand. The best way of avoiding problems is with any brand or mix thereof is to match speed steps in this order 1,28,14,7,21,... This will avoid any problems with any brand.